It’s a tough job driving to work – just ask the millions of Americans who commute every day. The average commute takes 25.5 minutes one way, according to the U.S. Census Bureau. However, 10.8 million people drive an hour or more to work each way. Some have it worse: approximately 1.7 million Americans commute 90 minutes or more each way. Abram recommends checking tires when they are cold (at least four hours after the vehicle has been driven). Check tire pressure with a reliable tire gauge and make sure the valve stems have a plastic or metal cap to keep out dirt, water and foreign objects. You can find the tires’ proper inflation level (as recommended by the car maker) on a placard in the glove box, on the car door or in the owner’s manual. Abram offers commuters more tips that will keep tires road-ready and wallet-friendly. For additional tire care and safety tips, visit www.yokohamatire.com or www.rma.org. * Tires that are balanced correctly will provide a smoother ride and help prevent improper wear. You can get your tires balanced at the same time as your regularly-scheduled rotation. 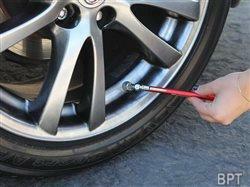 * Rotating your tires will also prevent uneven wear and promote a better ride. Because the weight distribution on your car or truck can vary, it’s best to rotate your tires a few times a year, such as every time you get your oil changed. * Check tire alignment once a year. Misaligned tires create unnecessary tire wear and higher fuel consumption. * Tires must be replaced when the tread is worn down to 2/32 of an inch (the lowest legal limit) to prevent skidding and hydroplaning. Best to replace before 2/32 depending on your drive (geographically and type of streets). Winter traction and wet traction start getting compromised well before 2/32. For example, rural streets that aren’t regularly plowed would be different than city streets that are regularly plowed. * Checking tread depth: place a penny upside down into a tread groove. If part of Lincoln’s head is covered by the tread, you’re driving with the proper amount of tread. If you can see all of his head, you should buy a new tire.